BAL – market-leaders in full tiling solutions – have lent their backing to a mosaic artist taking part in a fund raising art project in Birmingham. The Big Sleuth is a fund raising initiative organised by Wild in Art and Birmingham Children’s Hospital. More than 200 large and small fibreglass bears are currently being decorated by artists, schools and community groups across the West Midlands. Caroline Jariwala, a member of the British Association for Modern Mosiac (BAMM), has created “Sweet William Bear” – inspired by flowers quoted in Shakespeare’s writings. After attending two mosaic mural training courses at BAL – Caroline has fixed the mosaics with BAL Max Flex Fibre tile adhesive and has grouted the bear with BAL Micromax2 Ebony donated by the company. Sweet William Bear will be displayed in front of Birmingham Cathedral from July 11th as part of an art trail throughout the city. Each bear will be sold off in a charity auction in the autumn to raise money for the children’s hospital. 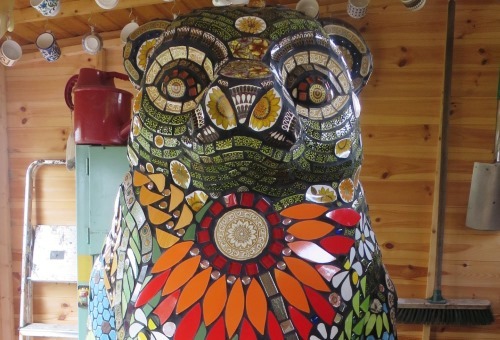 The Big Sleuth follows on from The Big Hoot in 2015, where 85 large owl sculptures were auctioned off, raising more than £5 million for the hospital. Caroline said: “The mosaic features ceramic tiles, porcelain and broken vintage crockery and draws inspiration from Shakespeare’s love of flowers used in his plays and sonnets. The Sweet William flower is said to been named after the Bard himself! A fitting name for a flora related bear! I have I have been using BAL Max Flex Fibre which has been wonderful to use and BAL Micromax2 Ebony grout. The texture, durability and true black finish of the grout is perfect to complete the project. “I am hoping that Sweet William will have a real “wow” factor, especially as it is located in front of Birmingham Cathedral. Alex Underwood, Head of Marketing at BAL said: “Caroline only had the ‘bear’ necessities to complete this project, so we were all too pleased to donate our Micromax2 Ebony grout. Preparing and tiling external areas with BAL External Tiling Solutions. For more information visit www.bal-adhesives.com/training.